I knew I should have grabbed the camera when I was making these. These are fast, easy, and taste good. Picky eaters ate them! So DING DING DING WE HAVE A WINNER! Try them and see! 1. Wash and pat dry the chicken. Remove any fat or sinewy, tendon pieces. Slice each breast into four narrow strips. Or slice into small chunks for nuggets. 2. Using the olive oil, brush or rub each piece of chicken. 3. Spread the breadcrumbs in a shallow dish or plate. 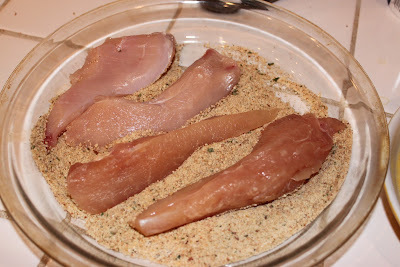 Roll the chicken in the breadcrumbs so it has an even coating on all surfaces. 4. 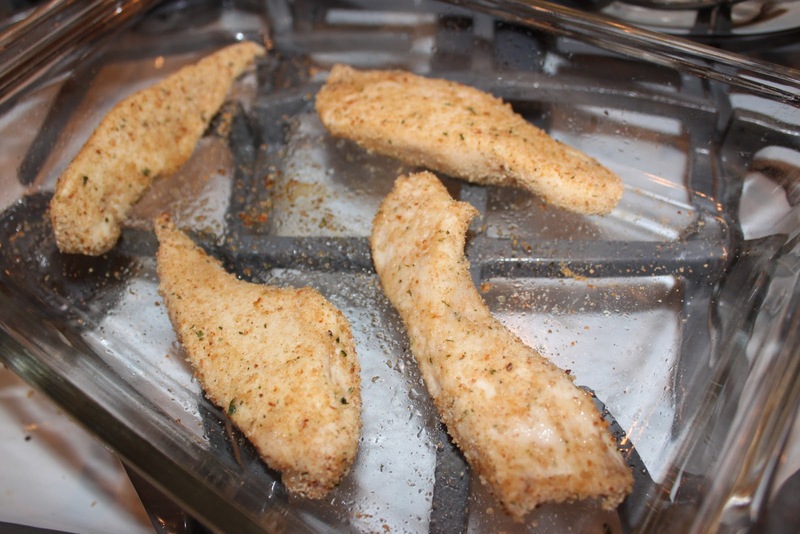 Bake in a preheated oven at 350 degrees F for about 15-20 minutes, depending on the chicken's thickness. Note: If you have plain breadcrumbs, add your own seasoning and mix well. You can use just about anything you like. I have some Luzianne Cajun Seasoning that is really good. You will need to taste-test the crumb mix just to be sure the amount of seasoning is right for you. Start with 1/2 teaspoon and work your way up if that's not enough.